I, Balamanikandan visited Municipality Middle School, B.Komarapalayam, Namakkal Dt on 1st May 2016- Sunday. No of classes: 1st std to 8th Std. School is located in town area of Komarapalayam. Weaving is the primary job. Students’ parents are working in power loom industries. Most of the students studying in this school are from economically disadvantaged background. School has sufficient no of teachers. We seek your kind support to fulfill the needs of this school one by one and make this school as a model school. Any partial/ complete support is welcome. Our onsite -Govt Hr Sec School, Renganathampettai, Karur Dt has proved once again their performance. First mark: 1109/1200 second mark: 1097/1200. Congratulations to students and teachers for the achievement by their untiring efforts. Indiasudar is very happy to see this school progress. One of our India sudar onsite Govt Hr sec school, Velliangadu, Coimbatore, Tamilnadu has scored 100% pass in SSLC exam. Thanks all volunteers and donors to make this happen. We supported student Ramya during her 11th std. Now she has secured 1150/1200 in +2 from Govt Hr Sec School, Kavunthapadi, Erode Dt. Congratulations to her for te great success. Members,Thanks for your continuous support. Father -Driver-Patient , Mother-Beautician. Staying in rented house. Student studied in govt school from 1st std. Dear all – One of the India sudar supporting school Govt Hr Sec School, Velliangadu, Coimbatore – Tamilnadu +2 result is mentioned below. Total no of students scored above 1000 marks are 12. Thanks all volunteers and donors to make this huge success and difference in this school. 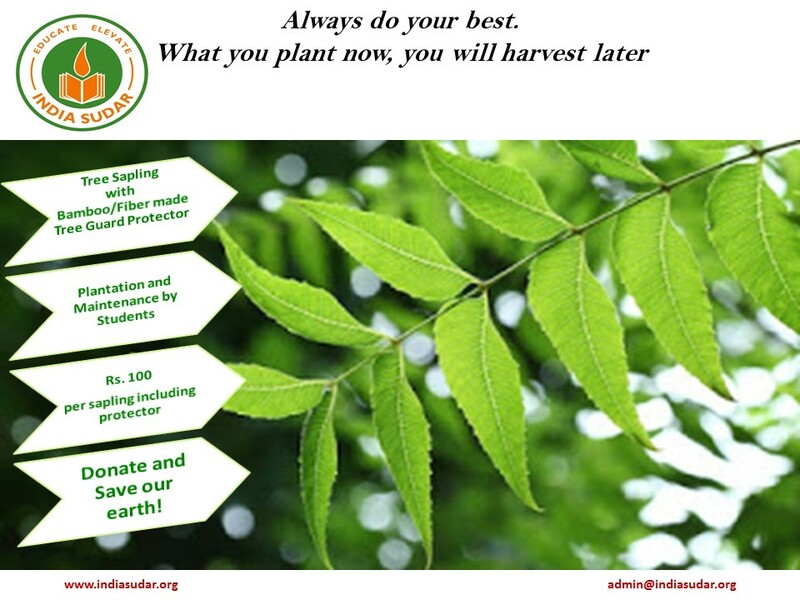 Indiasudar has decided to initiate tree plantation project to inculcate the attitude to save our environment in students. Plantation will be held at school campuses, public places. Maintenance will be taken care by students and safe growth of plants will be ENSURED. No of plantation depends on no of e-mails from you. Yes. Please come forward and join this initiative.